The new, completely revised Deluxe FreeRide is the ideal twin-tip for those who want to make full use of all the possibilities of freeriding. Freeriding means much more than just relaxed cruising and also includes high and even first unhooked jumps and tricks. 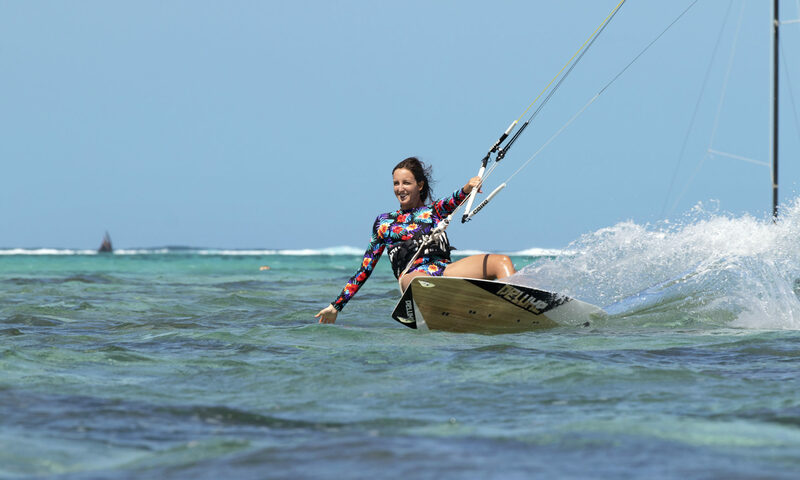 The FreeRide not only inspires beginners and intermediates with extremely early gliding and solid upwind running – even with minimal kite pull. Promises fun guarantee already in the lower to medium wind range. The Deluxe FreeRide was developed in close cooperation with the perfectionists of CARVED and CORE. Each board has decades of experience in the construction of surf and kiteboards, starting with the creation of the wooden shapes up to the final inspection of the processing. The classic, sophisticated 3D shape ensures a harmonious flex. The moderate but not too flat ground curve provides the basis for the perfect mix of control and planing ability. The two large freeride models in 141 and 150 cm have a special, slightly flatter ground curve for increased glide performance in light wind and underpower. The wood core is not only the basis for visual elegance. He is responsible for the smooth flex. The Paulownia wood naturally creates a harmonious flex balance between soft and medium. Most of the rails are rounded and slightly bevelled for comfort in the chop. Only at the tail the edges are sharp. The “3D Control Rails” are otherwise only found on high-end boards. For jumps, the complex edge shape guarantees maximum hold during edge bending and a well-dosed grip for safe landings. A concave runs in the middle part of the underside, which facilitates chamfering and increases control in strong winds. The upper and lower sides of the freeride have a scratch-resistant and UV-resistant outer layer. This increases the durability on the water and protects the board in everyday transport. The highest quality standards are applied in the production of deluxe boards. DELUXE boards are available for kite schools only.